Northeast Florida and Surrounding Area's PREMIER Magazine for Autism Spectrum Disorder! Subscribe for your FREE Online Digital Copy! Tips, Strategies, Articles, and More! Receive the latest online digital issue on ISSUU. Added to our 'V.I.P. Group to receive: Exclusive offers from our community partners, giveaway offers, invitations to inclusion outings before we extend to the community, and updates on the latest happenings for autism families in Northeast Florida. Additional subscription levels coming soon. all past magazines are available on issuu! Please advise what type of article, information, or news you would like to have published in our magazine or blog. Get your business, products, and/or services noticed in the autism community! Want to get your articles published? Do you have a product or book you would like reviewed? Do you have a story that needs to be heard that would be a great fit for our Featured Article section? 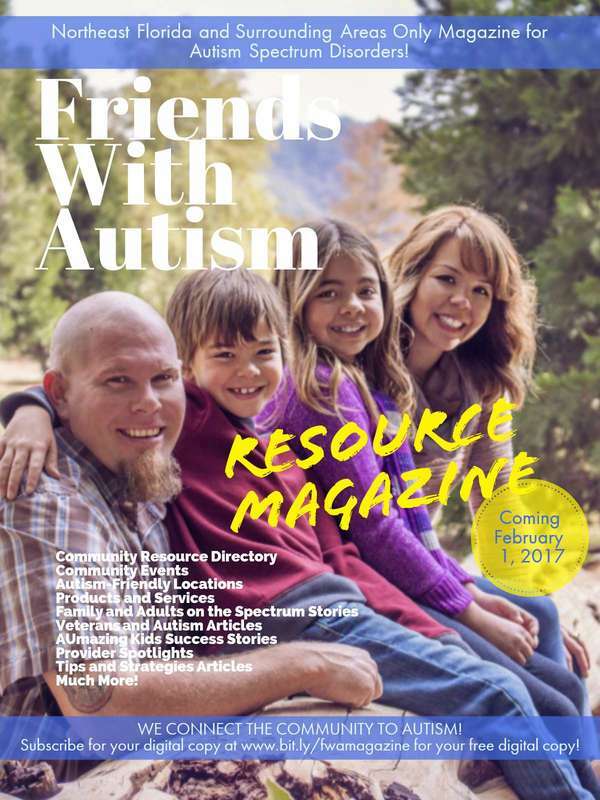 For a Friends With Autism Resource Magazine Advertisement Rate Sheet and Submission Guidelines contact info@makingstridesforautism.org. In no event will Making Strides for Autism or its affiliates be liable for any incidental, indirect, consequential, or special damages of any kind, or any damages whatsoever arising out of or in connection with the use of this publication or its contents or any other organizations referred to in this publication. The views and opinions expressed in the following articles are those of the authors and do not necessarily reflect the official policy or position of Making Strides for Autism or its affiliates. Examples of analysis, treatments, or recommendations performed within this article are only examples. They should not be without consulting your professional medical or therapeutic providers. All content and images used on this site are owned or licensed by Making Strides for Autism and affiliates for use on this site only. Unauthorized use is prohibited. Nothing contained herein shall be construed as conferring any license or right under any Making Strides for Autism or affiliate copyright or trademark. This publication may contain information on medical, therapeutic, and health-related topics. This information is not meant to be a substitute for the advice provided by your own physician or other medical professional. You should not use this information for diagnosing or treating a health problem or disease but should always consult your own physician.